The Three Little Pigs has always been our of our favourite bedtime stories. We don't just read the book, we will even act out the story and it has never failed to attract squeals of delight from the girls. They love pretending to be the pigs who protect and look after one another, and unless the hubby is around, I always end up being the Big Bad Wolf. Which I really don't mind because it's kinda fun to be able to huff and puff and run around chasing after the little ones. 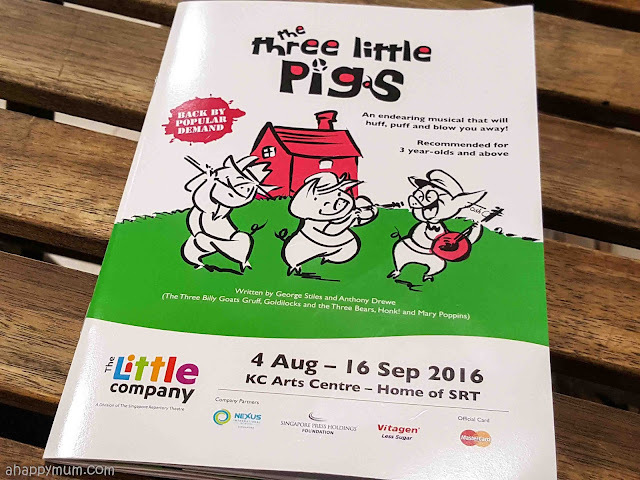 So, when we knew that Singapore Repertory Theatre's (SRT) The Little Company was bringing back The Three Little Pigs this year - after making its world-premiere in Singapore in 2012 and subsequently blowing its way around the world, including countries and cities like New York, Finland, Sydney, China and London - I knew that this was one show that we could not miss by hook or by crook. You know, we've watched plenty of theatrical shows for kids because my girls just seem to enjoy them tremendously. I can't say the same for the hubby, or even for myself sometimes, because there were occasions when it seemed like the show was designed and dedicated for the enjoyment of the young audience only. However, TLC's shows are different. Really different. I don't know how they manage to do it but time after time, I've been so impressed with them and I walk out of the theatre, feeling like I'm just watched a smashing good show that kept me glued to my seat and brought smiles onto my face. 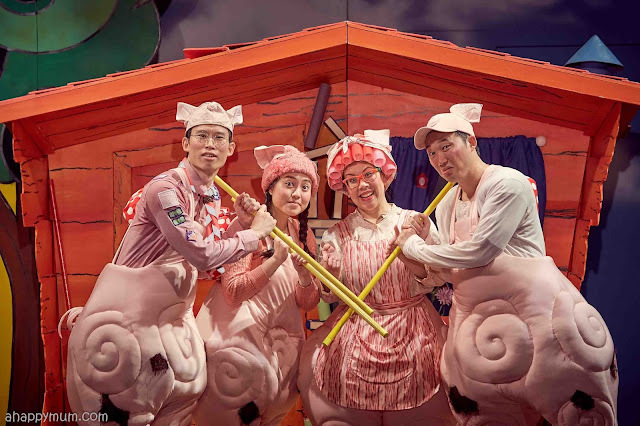 It wasn't just the kids who were enjoying the performance, every adult who was present was entertained and we truly enjoyed The Three Little Pigs from start to end too. Okay, actually all of us enjoyed it except for the one little sleepy pig. Yes, the tiniest one in my brood. I have to be so thankful that infants are allowed to admit, otherwise we might have to skip such outings since the baby is with me 24/7. Yes yes, babies do need tickets too but at least they are allowed to enter, right? I usually walk into the theatre, not knowing what to expect for the next 50mins. Will the songs be catchy? Will the plot be different and creative? Will the dance choreography be memorable? Will the stage set resemble what we see in storybooks? Will there be any new elements that will impress the audience? Will we be laughing in our seats? Will the kids learn about any morals or values? Will we be talking about this show a month later? Honestly, I'm the kind of person who doesn't set high expectations. It's not that I fear disappointment, but I just like to be contented with things that come my way and anything that is extra good becomes a bonus. You know what I mean? 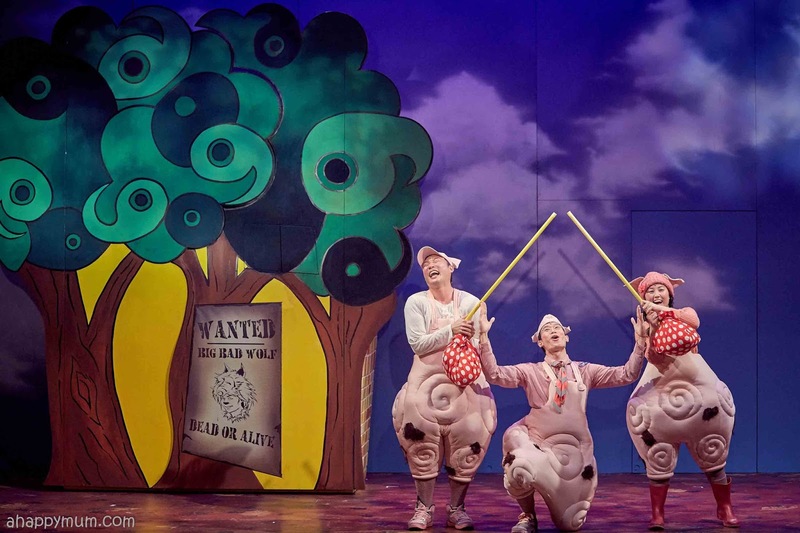 I'm happy to say that The Three Little Pigs is definitely my favourite show so far this year. 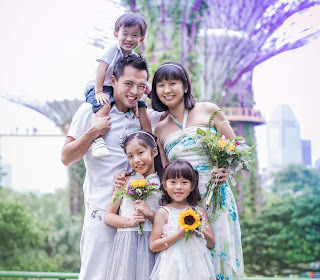 In this post, I'll share with you the main reasons why. Everyone knows the story of the three little pigs. If you think just because you know the story and will not be in for any surprise, then you are absolutely wrong. 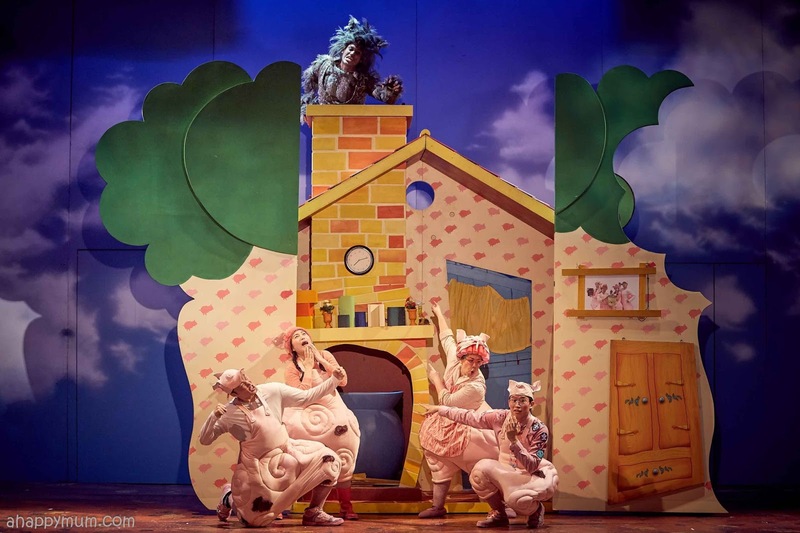 What I love about The Three Little Pigs is how it builds on the classic fairy tale and adapts along the way to become something so fresh, so unique and so full of.... meat. It makes me think "I know what's going to happen next! Oh wait, do I?" and even when I did guess the sequence correctly, the plot never failed to add in some twists and turns in between so that all of us became totally engrossed in it. 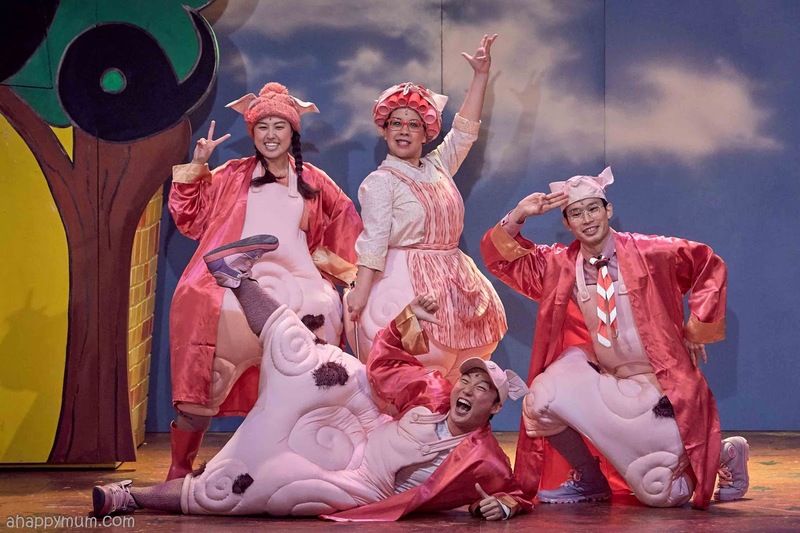 You can never guess the names of the three little pigs in this show. Well, they were called Cha Siu Bao. Yes, seriously. Angel was the one who read about it in the booklet and told us excitedly before the show started. These pigs don't just have cute names; they each have a distinct personality, for instance Cha is brawny, Siu likes gardening while Bao is a bookworm. Despite their differences at the start, they came together eventually to pit against the Big Bad Wolf and I love it when Mother Pig said "A family sticks together". I have to say that all the cast were so awesome that it's hard to pick a particular favourite. If I have to, I would say both the hubby and I were particularly impressed by the Big Bad Wolf who played the part of the howling, starving, sneering villain brilliantly. There's something special about watching TLC's shows - the local flavour that can't be replicated easily by overseas productions. I was particularly tickled by the appearance of a convenient tradesperson who happened to pass by and sold straw, sticks and bricks to the three little pigs. I mean, she appeared as a samsui woman and went off saying "Kopi Siu Dai". That was totally funny and never mind that the kids didn't understand it, all the adults were laughing (I know I did, and quite loudly in fact)! 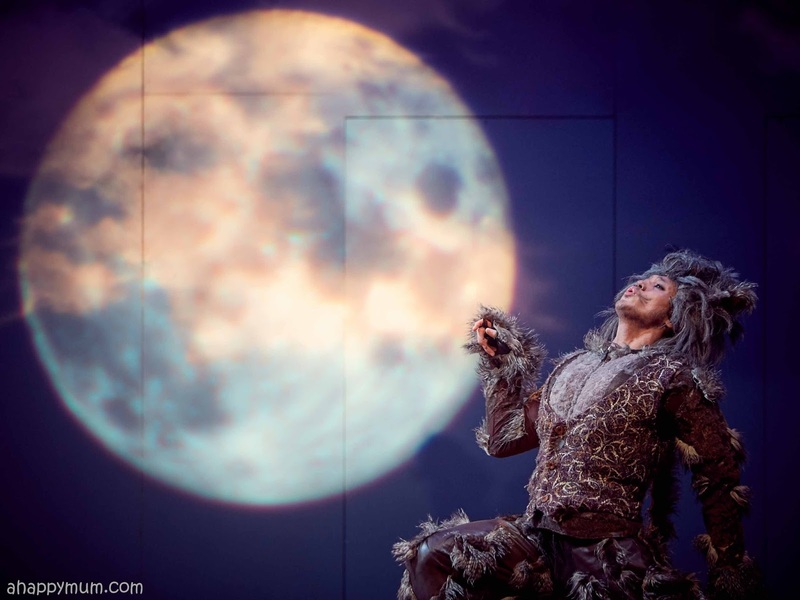 The Big Bad Wolf also had some hilarious moments such as when he said things like "So Malu" and "Double Whopper". Yes, to eat one pig - roasted pork. Two pigs - double whopper. Three pigs - all you can eat buffet. Who thinks of such clever lines like these? Now, while I can't say that the dance moves were impressive and I assumed that it was in the first place pretty hard to move about with those gigantic hips, I did love the repertoire of songs. These original songs were superb and a couple of them struck a deeper chord in me than the rest. I was particularly touched by how Bao encouraged his siblings to build a house with him so that they could all stay together. "A little house, a little home", yup, this line is going to stay with me for a long, long time. 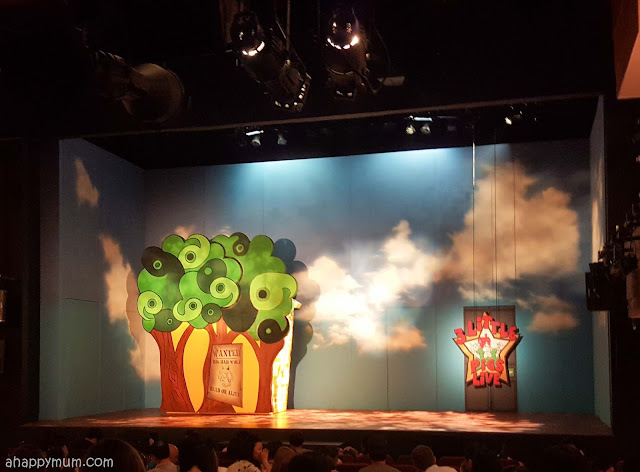 For a production of this scale and a ticket pricing that is friendly on the pocket, you don't usually get to see an impressive stage set or a wide range of props. That is another area in which TLC excels and totally deserves a pat on the back. In The Three Little Pigs, the scene changes and you can really watch the story unfold as the pigs leave home, build houses and eventually trap the wolf. I'm not going to spoil it for you by telling you how he huffed and puffed down the houses (they did collapse! ), so be sure to watch out for it and also be amazed by the dainty house of bricks - which has a door that can be opened, a window that can also be opened, a ladder for the wolf to climb up and even a chimney to drop into. I totally give it to the team who worked behind the scenes to create this from scratch. It looks fantastic, guys! We like to talk about what we've learnt after watching a show, rather than just laugh and forget all about it tomorrow. The Three Little Pigs has so many lessons for us to learn and reflect upon, from how hard work pays off, never look down on others and unity is strength. 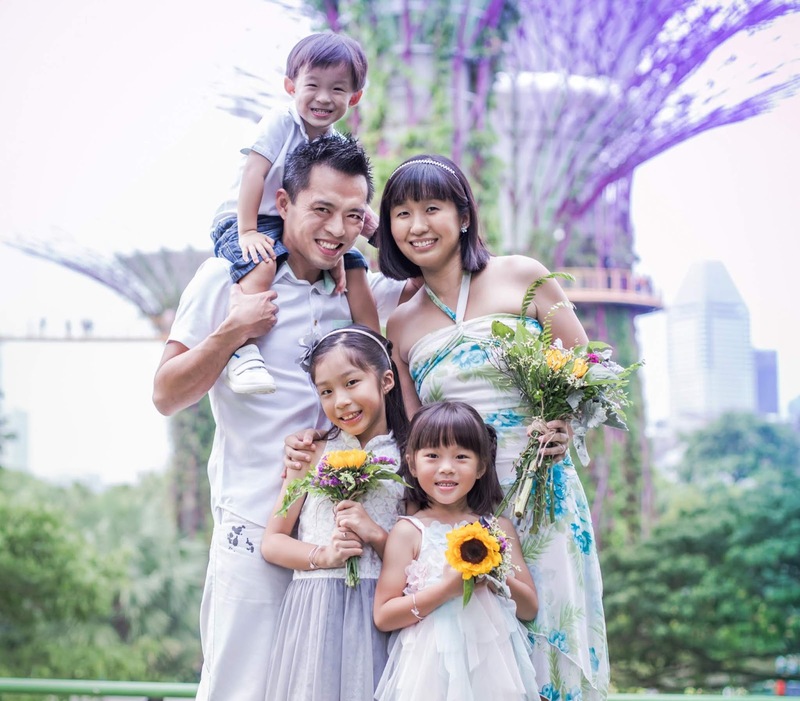 The biggest takeaway for us was how a family needs to stick together to overcome hurdles in life. You know what I love most about the story? It was the ending where the three little pigs not only got together and stayed inside ONE house, they also invited their dearest Mummy to stay with them. Yeah yeah, I know, that's not going to happen with my three little pigs two decades later and there comes a day where I need to let go. But, such happy endings always warm my heart and I'm always going to remind myself and my kids that no matter what happens in life, a family sticks together. A big thank you to TLC for bringing back this awesome, spectacular show once again! I've no question on why it will make a comeback because I, for one, don't mind bringing my kids to watch it again in future if there's a chance. One thing I'm very sure of, this show totally made us howl with laughter and blew us away. For more reviews and thoughts on The Three Little Pigs from fellow mummy bloggers, head over to A Million Little Echoes and Mum in the Making. Prices: From $25 excluding SISTIC fee. The Little Company (TLC) is a professional theatre company that produces quality plays for children. Since 2001, over 400,000 children and adults have been delighted by our performances. We aim to enthral children from ages 2-12, with theatre that is written, designed and performed specifically for them by professional adult actors. We strongly believe that theatre can help children develop socially, mentally and emotionally. 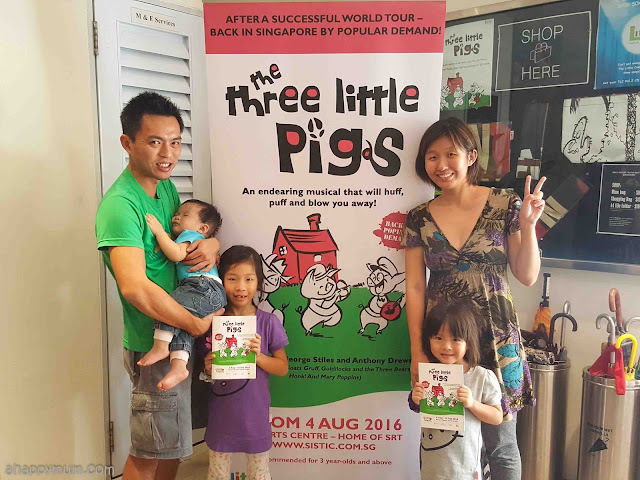 TLC was founded in 2001 by Singapore Repertory Theatre, based on the belief that children deserve the same quality of theatre as adults. 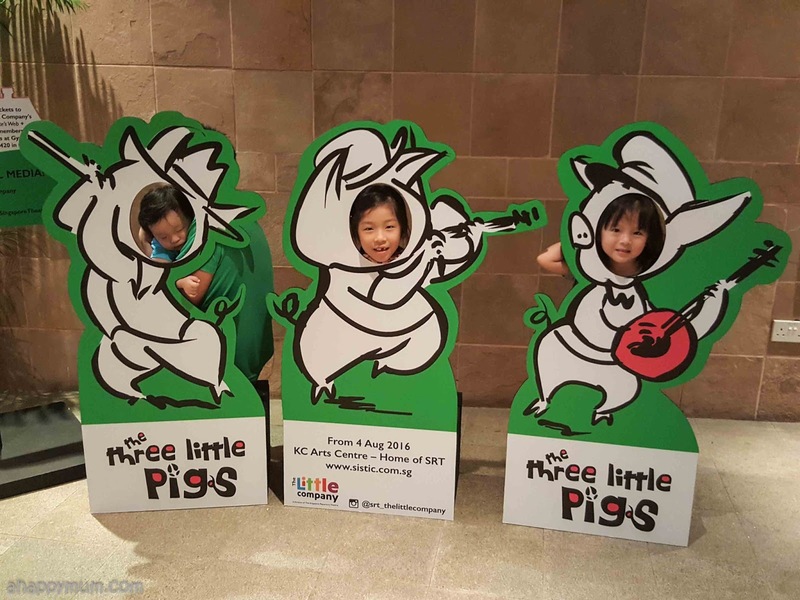 Disclosure: We received a media invite to review The Three Little Pigs. Production pictures are provided by SRT. All opinions are our own.